Summer Foodie Friday is back on the 17th June! 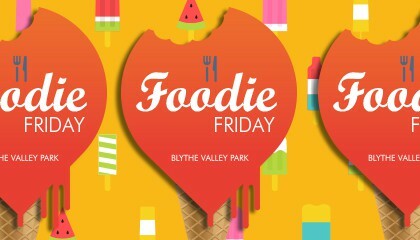 Foodie Friday returns on Friday 17th June 2016 from 12 – 2pm on the Blythe Valley Park Lawn. Click read more to see which wonderful foods will be on offer….plus how you can win tickets to Wembley in August! We look forward to seeing you there! Foodie Friday is back, and as usual we have a great offering of tasty street foods for you to sample…. Gourmet burgers such as chorizo, beef and pork are all on offer from Mr V! Street Chef will be offering mexican delights like quesadillas and of course churros with chocolate sauce! Finish it all off with a traditional English Ice Cream from Ice Ice Mikey! And there’s more! Aidan and the Wildfires will be providing some toe tapping live folk music, and there will be pop up table tennis on the lawn so you can challenge your colleagues – whoever loses buys lunch! There will also be a competition as we’ve got Euro fever! Simply enter your name and email address in a ballot on the day for the chance to win a pair of tickets to Wembley in August! You’d be mad to miss it!